„Doing Business in Germany“ was the title of the event held in Thessaloniki and hosted by the German consulting firm WIG GmbH in cooperation with the law firm Kosmidis & Partners KPAG and certified auditors Wirthschaftstreuhand GmbH. The event addressed issues concerning the Greek extraversion and entrepreneurship in Germany by various specialists such as lawyers, auditors, human resources and subsidies consultants and real estate agents. 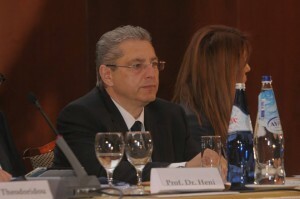 The event, which lasted approximately six hours, was attended by the Consul of Germany Mr. Dr. Ingo von Voss, who saluted the guests, did mention that there are better days to come for Greece following the latest developments in economy and congratulated the above on taking the initiative to organize such an event . On Friday, the 11th April 2014 the German consulting company Wig GmbH and its partners KPAG Kosmidis & Partners Law Firm and Wirtschaftstreuhand GmbH organized the event „Doing Business in Germany“ at Hyatt hotel in Thessaloniki. The event was aimed at informing attendants about investment opportunities in Germany and presenting the legal and tax implications of doing business in this land. Several lawyers, tax advisors, CPAs and other consultants presented the current situation in Germany, the company and tax law in force from a practical point of view, the current opportunities in the German real estate market as well as the subsidies offered by the German state to foreign investors. The event was attended by businessmen and entrepreneurs from several sectors and lasted approx. 6 hours.